Roast turkey becomes full of flavor with this blend of herbs that permeates the meat. 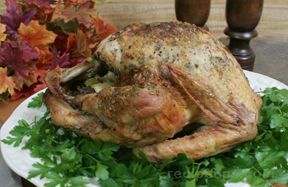 See how to apply the herb butter when preparing this turkey recipe for Thanksgiving dinner or any special occasion. Use our turkey cooking times for a perfectly done turkey. Blend the first eight ingredients in a mixing bowl. Place the turkey on the rack in a roasting pan. Starting on the neck end, gently slide your hand between the skin and the breast, thigh and drumstick to loosen the skin from the meat. Using your fingers, spread the seasoned butter under the skin and all over the meat. Fill the cavity of the bird with the celery, onion, carrot, and dried thyme. Tie the legs together loosely with kitchen twine. Brush the turkey with melted butter and sprinkle with salt and pepper. Pour 1 cup of the stock in the bottom of the roaster. Place the bird in the oven and roast, uncovered for 30 minutes. After the 30 minutes, reduce heat to 325° F.
Pour 1 cup stock over the turkey and continue roasting, basting occasionally with drippings. Time will vary when turkey is done depending on the size of the bird. If browning too much, lightly cover with aluminum foil. When a thermometer inserted into the thick part of the thigh reaches 180Â° F, the turkey is done. A 10 1/2 pound turkey takes approximately 3 1/2 to 4 hours. Transfer the turkey to a serving platter. Allow it to stand for 30 minutes so that the juices re-absorb. Lightly cover it with foil to keep it warm while it rests.